These tasty gluten and grain free chicken tenders came from a recipe I found on Marksdailyapple and are super easy to make. They’re a great alternative for kids, and perfect to use atop a salad when you’re craving a bit of a salty/crunchy treat. Plus they’re perfect to pair with an asian-inspired or spicy-fruit dipping sauce (think mango chutney) if you want to serve them as an appetizer instead! Finely grind nuts in food processor, but don’t grind them so long that they turn into paste. Combine the ground nuts with the chopped herbs. Lightly beat raw eggs in large bowl. 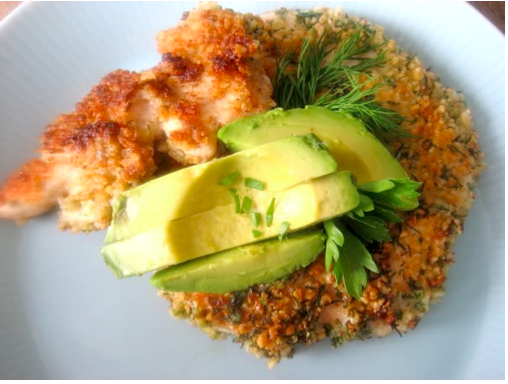 Dip chicken cutlets in the egg wash and coat both sides with the nut mixture. Place chicken in skillet and cook until browned on both sides and cooked through, about five minutes a side. This is genius! I’ve never thought to use nuts as a chicken tender coating, and since going paleo, tenders are one of the few things me and my guy craveeeee. Thanks for the great idea, can’t wait to try it out!